Last February 16 and 17, the Hispanic Educational Technology Services (HETS) Consortium (HETS) celebrated its 2012 Best Practices Showcase: Celebrating Innovation in Access, Retention, Assessment, and STEM Education to Promote Hispanic Student Success in Higher Education. The Conference took place at the Law School of the Interamerican University of Puerto Rico in San Juan. 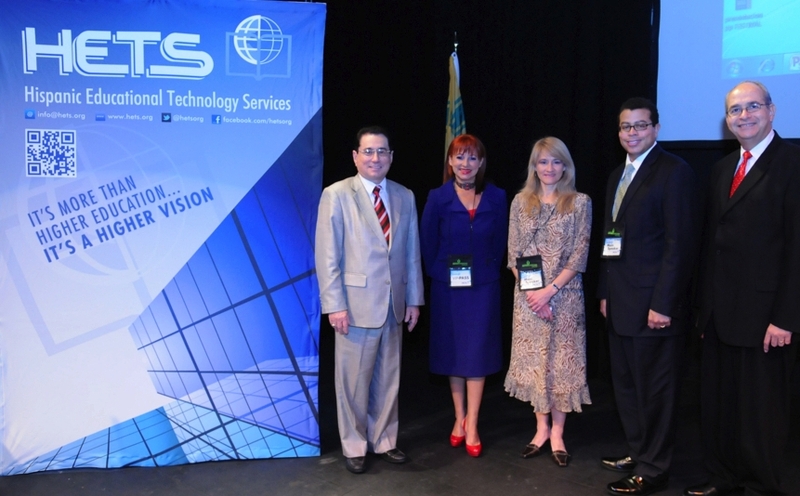 “This is the second time the HETS Consortium gathers more than 25 higher education member institutions from Puerto Rico, United States and Latin-America, to share their innovative initiatives and best practices in the integration of technology and education for the benefit of the academic community”, said HETS Executive Director Yubelkys Montalvo. Through 35 presentations by faculty and administrators from Hispanic Serving institutions, HETS celebrated the innovative use of technology to promote Hispanic student success in the areas of Access, Retention, Assessment, and STEM education in postsecondary education. Topics included new classroom technologies, innovative learning support tools, collaboration tools, and the integration of social media networks to the learning process, among others. The event opened with an expert panel discussion with two representatives from HETS member institutions and one partner organization, including Dr. José Jaime Rivera, President of the University of the Sacred Heart; Dr. Ivonne Chirino, from Walden University; and Mr. Reggie Smith III, from the United States Distance Learning Association (USDLA). These experts shared their position on the importance to ensure Hispanic student’s access to education, retention of these students so they can achieve their academic goals, the assessment of learning of these students and strategies to increase enrollment of Hispanic students in careers in science, engineering, mathematics and technology. 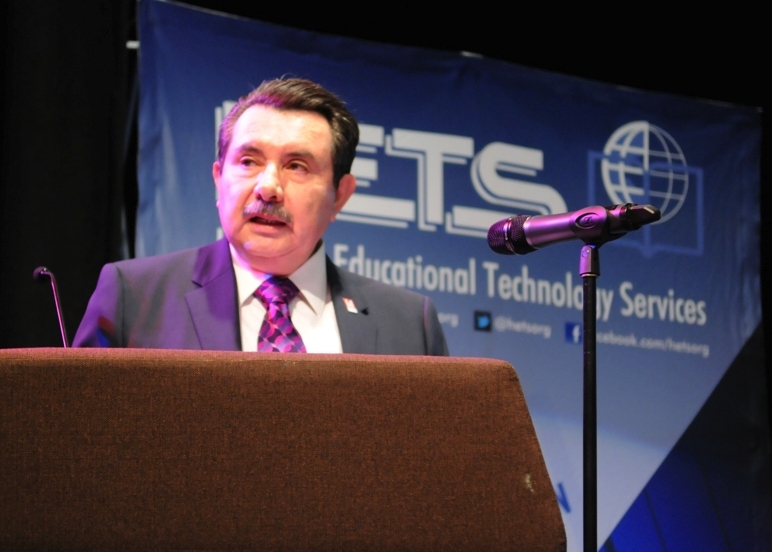 Dr. Antonio R. Flores, keynote speaker of the 2012 HETS Best Practices Showcase. A major highlight of the 2012 Best Practices Showcase was the keynote address from the President and CEO of the Hispanic Association of Colleges and Universities (HACU), Dr. Antonio R. Flores, regarding the Future of Hispanic Students in Higher Education. Dr. Flores is currently responsible for directing the largest national association representing existing and emerging Hispanic Serving Institutions (HIS’s) across 32 states, the District of Columbia and Puerto Rico. Other notable session included a pre-conference event with Oracle on innovative tools for academic and administrative optimization at universities. Participants from more than eight HETS member institutions in Puerto Rico benefited from this conference. Students took advantage of the HETS Academic Fair prior to the conference. HETS also took advantage of the opportunity presented by this event to showcase its member institutions’ Academic offerings through an Academic Fair for students and professionals interested in pursuing a college degree. More than 500 students from public and private high schools, as well as college students and professionals, visited the fair to learn more about the opportunities to continue their education and also learn from internship programs. To learn more about the event, please visit the Best Practices Showcase section in the HETS official website at www.hets.org. For information about other HETS initiatives, or to express your interest in the 2014 Best Practices Showcase, call 787-766-2600, extensions 8910 and 8911.